My husband loves football. I could care less, but I’m trying to learn because I don’t want to be completely left out when he starts to get our daughter into watching the games! Since football is going to increase in popularity around our house, I decided to try some recipes from the Gooseberry Patch cookbook: Our Favorite Game-Day Recipes. There are a ton of great recipes that range from appetizers, sauces, main dishes, and desserts! I am saving some of the crockpot ideas for the future. I mean, how delicious does “easy taco soup” sound?! This busy momma loves her some crockpot meals! This little cookbook is just so cute! It is about 5½” wide (not counting the spiral binding) and approximately 4¼” tall. Being compact is an excellent quality for a cookbook to have, because if you cook like me, you are taking up so much counter space laying out all the ingredients! The cookbook maybe small but it packs a lot of punch! Aside from over 120 pages of recipes, Gooseberry Patch also puts some great tips and ideas for serving food, and hosting parties, on every other page of the book. I think my choices make a pretty good spread for some game day guests! I prepared three recipes: 7-Layer Mexican Dip, Tex-Mex Meatball Subs, and White Chocolate Crunch. So let’s dig in! 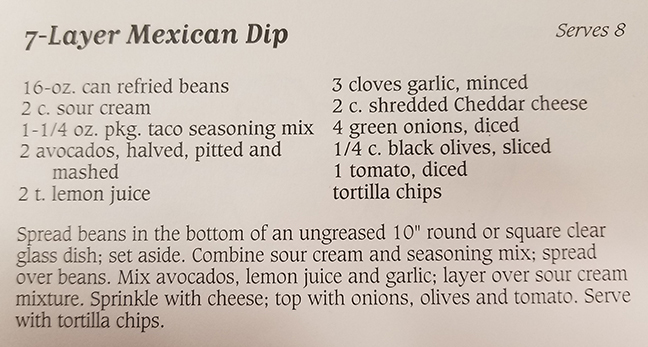 At almost every family gathering, my aunt makes a similar dip and I could literally eat the entire dish myself! It’s addicting! And I have made it a few times to take to potlucks and everyone usually agrees. It is super simple to make. I changed just a few things, aka: I don’t like those particular ingredients, so I left them out (LOL!) For me, it was a no go on green onions, garlic, and black olives. I recommend having your avocado layer on top of the beans instead of on top of the sour cream. Avocado starts to turn brown pretty quickly, so to keep the presentation nice, layer it somewhere else! I like to prepare it in a tin foil pie pan, that way I don’t have to worry about waiting to get my dish back. It travels super easily, comes with a lid, and then you just toss it when you’re done. It is excellent! I usually try to have a stash on hand, and purchase them at the Dollar Store! HUSBAND GRADE: B. He likes a bit of heat, so he suggested a layer of medium salsa, or the refried beans that have a little kick to them. CO-WORKER GRADE: A+! They agreed with me 100% that it is addicting. I could hear them going back for more…and more…and more. ha! Never in my life have I made meatballs. I was nervous! The directions didn’t mention to line your baking pan with anything, just said to leave it ungreased. I put some foil on, and I suggest you do the same! I didn’t want to have to soak any baked on junk! I wasn’t sure how to really drain from a pan, it was awkward to try to pour out the grease. I just scooped out the meatballs into a bowl and poured the sauce over them. HUSBAND GRADE: He teetered between an A and a B. Again, he wanted more heat. So next time (and he did say next time, so I guess this meal is going to happen again! ), he suggested maybe a bolder spaghetti sauce. I forgot to tell him to get the optional addition of jalepeños, when he went out with the grocery list in hand. My bad! CO-WORKER GRADE: Another A+! I felt bad because I forgot to tell the hubs to get two packs of hoagie buns, so I had to cut up the two buns left so that everyone could try a little bit! I think I heard someone say they could eat more, specifically at least a 12″ sub! I went old school with the popcorn and prepared mine on the stovetop. 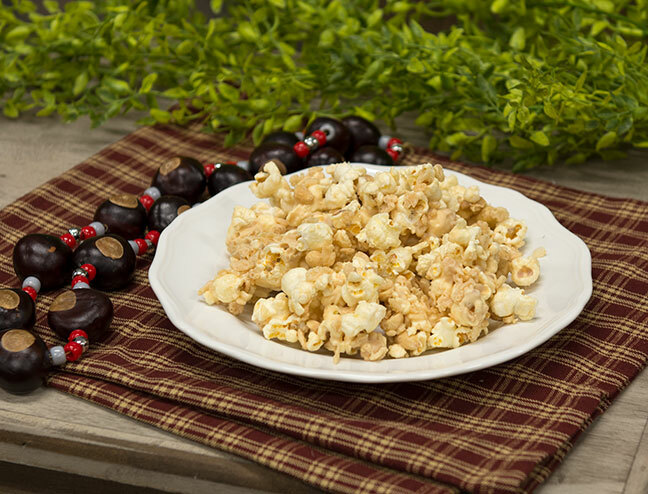 No microwave popcorn here! But it is totally easier to just pop in the microwave and ease is what they were going for here. My melting chocolate took a lot longer to melt in the microwave than what the directions on the bag had suggested, but once it melted, it was creamy goodness. I am not sure how long it takes to actually dry after coating everything, but my clusters stayed on the soft side. So when the directions said “break apart,” I was expecting it to be a bit hard, and it wasn’t at all. This recipe made a TON. 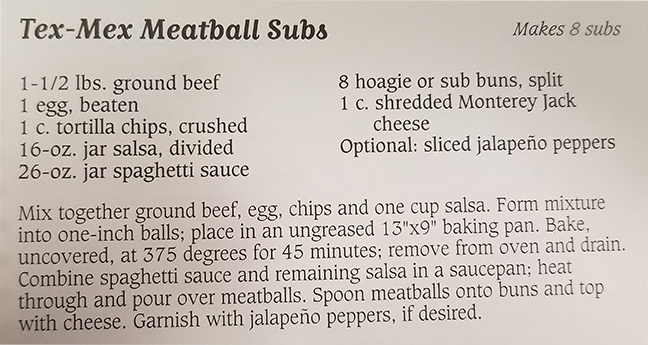 I didn’t realize until later that in the corner of the recipe it says that it makes about 18 cups. So this is definitely a good snack to make when you are going to have quite a few people over. HUSBAND GRADE: A! Which really surprised me because he isn’t into sweets all that much. He said it reminded him of kettle corn! CO-WORKER GRADE: A and B+. Some people weren’t that into the sweetness, while others came back for more. 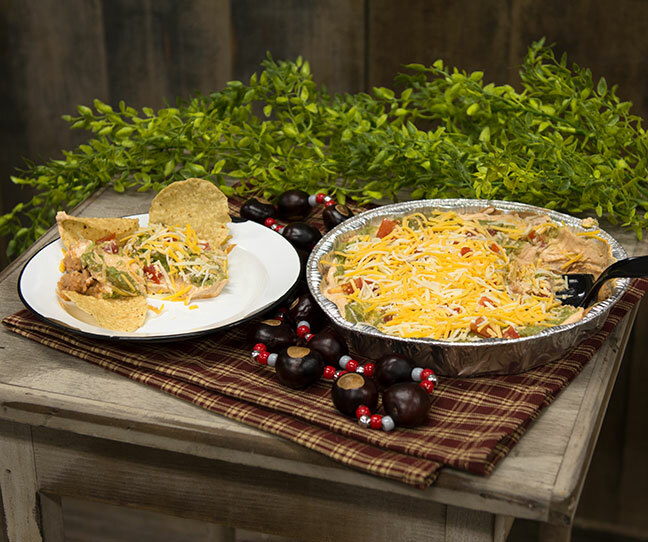 Either way, we can agree that it is a perfect snack for a football party! Which recipe are you going to try at your next party? 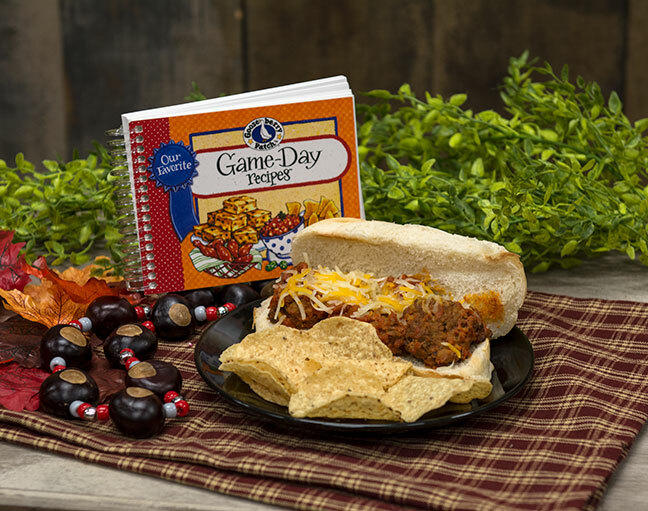 Tell me about some of your “go-to” recipes for game-day!